When another website links to your short-term rental site, it is an endorsement of your quality and credibility. So, it's easy to understand why linking is a key factor in search engine ranking algorithms. But what's more difficult is creating an effective external link building strategy to improve your SEO. Two of the top ranking factors, according to Google, are links and content. With that in mind, you will want high quality links pointing to your website in order to rank higher in the search results. If you aren't yet comfortable with creating content, performing keyword research or editing technical and on-page SEO, we recently released a free SEO eBook intended specifically for short-term rental property managers and owners. We'll walk you through step-by-step instructions on how to effectively implement all aspects of SEO into your site over time. Download the free MyVR SEO eBook by clicking below! 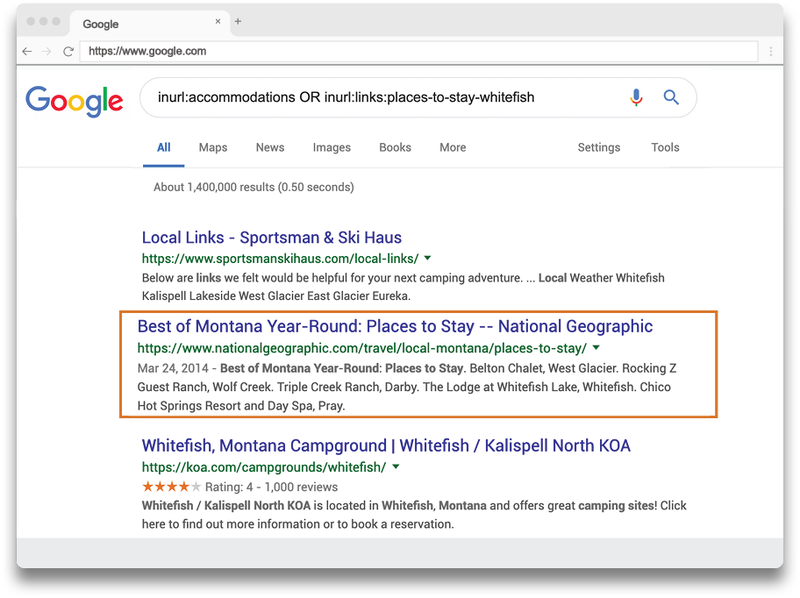 If link building is the next step in your SEO strategy, there are lots of ways to find linking opportunities, from getting a mention in local media to networking with local business owners and guest posting on travel sites. But how does one uncover those opportunities? Here are some simple ways to find those pages or websites that link out. Let's start with the basics. Before you can expect others to link to your site, you need to create a list of targets who are likely to do so. This list will consist of other websites and contacts that can benefit from what your site and its content have to offer. 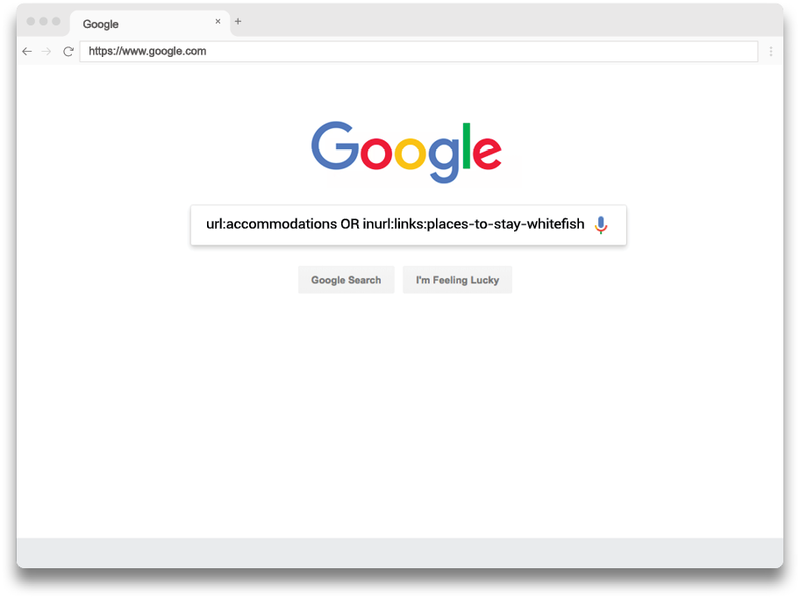 The first step to creating a list of targets is, in Google, search for: "inurl:accommodations OR inurl:links OR inurl:places-to-stay + your destination." In our Whitefish example, we found several pages that we can get a mention on. And so on. In just 10 minutes, we found highly relevant targets that can provide an SEO boost as well as solid referral traffic. Write a short blurb (ideally less than 100 words) about your business and why you’re getting in touch. Ask if you can learn more about how to get a mention (don’t use the word link) on the page you found. Another way this target gathering process could be repeated is by looking through your competition’s link profiles to see how they’re building traffic - an audit you can also do with Ahrefs. It’s common that top-ranking local websites in any destination have anywhere from 100 - 1,000 websites linking to them - plenty of opportunity! Enter your competitors' URLs here and their links will show in the results. The most important thing to remember is to be proactive and persistent when trying to build up links to your website. Link building can be hard and will take some work, but if you stick with your strategy and continue reaching out to target websites, you will see results in time. To learn more on how to build links and drive more traffic to your website, download the free MyVR SEO eBook to take the next steps toward optimizing your vacation rental business! To expand your understanding of vacation rental marketing, as well as the highs and lows of being a manager and owner, go right to the source with five of our favorite vacation rental blogs and podcasts. An obvious way to grow your short-term property management business is by booking more guests, but another way is to bring on more owners. Both means of growth can be nourished with the proper technology, but today, we’ll focus on adding more properties to your portfolio.